Estate Planning allows you to plan while you are alive in well for disability or incapacity. Estate planning allows you to give, what you have, to whom you want, the way you want, and when you want. Estate Planning allows you to leave a legacy for your family. An effective estate plan can help your loved ones avoid the burden of probate and disputes over your estate, while allowing for you to hand pick those you wish to be in charge of your health care and financial decisions during your life as well as allowing you to hand pick who you wish to be in charge after your death. Don’t leave these important decisions up to the State of Florida, you should be the one who decides your estate plan. 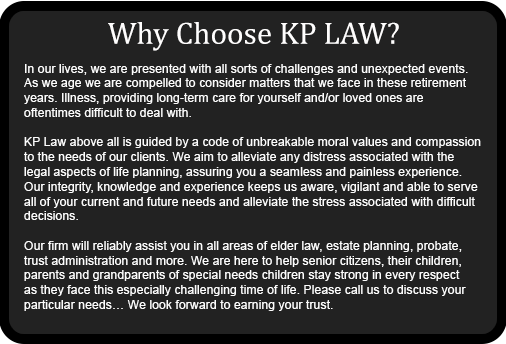 We help guide you and your family in long term and asset preservation planning. The laws in this specialized area of Medicaid planning are in a constant flux. There are numerous tools and planning options including government benefits, such as Medicaid and Supplemental Security Income (SSI), but they are not the only options. Navigating the complex maze of long term care is hard to do without legal guidance. Let us help guide you in navigating the long term care planning maze. Consulting with our office early on will enable us to specifically tailor a plan to you that meets your goals. Click on a Link Below for a Detailed Explanation. benefits before the Department of Veteran Affairs.